So, imagine me typing this on my laptop under like a million blankets. Anyway, upward and onward. Here's what happened this week in horror. SXSW announced their midnight line-up this week. In addition to the two anticipated titles that played Sundance in January (The Nightmare & Turbo Kid) there are also a bunch of other goodies. ABC's of Death 2 producer Ted Geoghegan sits in the director's chair for We Are Still Here, a haunted house tale featuring genre vets Barbara Crampton and Larry Fessenden. 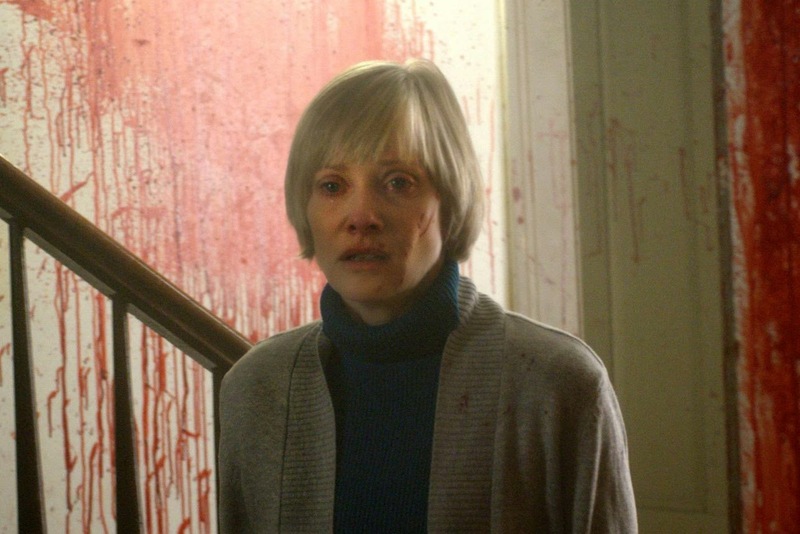 Barbara Crampton in We Are Still Here. Karyn Kusama follows her 2009 horror effort Jennifer's Body with The Invitation, about a dinner party where the hosts may have more sinister intentions. Following in the footsteps of last year's winner The Babadook comes The Diabolical, featuring Ali Larter struggling to protect her two children from a malevolent presence inside their home. Ali Larter in The Diabolical. British bad boys Adam Mason & Simon Boyes tackle the home invasion genre with their gritty thriller HANGMAN. Perhaps the most fun offering is Deathgasm from New Zealander Jason Lei Howden. It looks like another great line-up this year, and I can only hope most - if not all - filter on up to Canada in the next year or so. BBC Three will soon be airing the world's first zombie reality show, I Survived a Zombie Apocalypse. The idea is for ten people to compete to stay alive, while completing survival tasks in the shopping center in which the game takes place. Here's the pitch. I enjoyed watching Darren Brown's Apocalypse, so I'll definitely give this a whirl. It begins this evening, so click here for the show's home page on BBC3 for more info. There were a lot of trailer that hit the Web this week. First is the trailer for the new Guillermo del Toro picture Crimson Peak. Great cast. Great visuals. I'm a little worried about the visual effects, but I'm in. Next, is the trailer for Jon Knautz's new film Goddess of Love. I was a huge fan of his under-appreciated sophomore effort The Shrine and it looks like he is trying some new things here stylistically. I eagerly await this. Then, there is this trailer for the Blair Witch Making of documentary, The Woods Movie. Love it or hate it, there is no disputing The Blair Witch Project's contribution to the horror genre. This'll make a nice double bill with Sticks & Stones, the 1999 exploration of the Blair Witch legend. Lastly, here's some great news I wanted to share. Kane Hodder is joining Tom Savini's upcoming slasher video game Summer Camp. Here's the announcement video from the man himself. Even though that “official” Friday the 13th game managed to put the kibosh on 5 vs 1 aka Last Year, I still hold high hopes for this one and Until Dawn. Be sure to look for them this year.